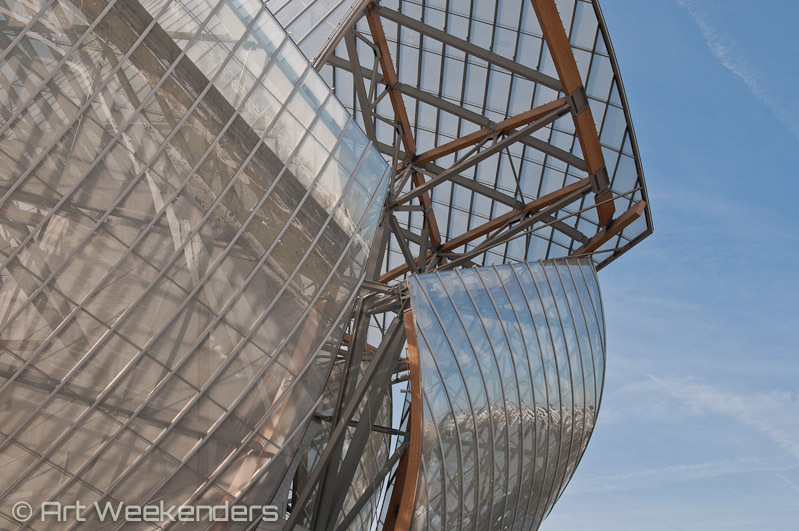 One of the newer additions to Paris’ museum landscape is the contemporary art museum La Fondation Louis Vuitton, or simply translated the Louis Vuitton Foundation. The architecture of the modern ship-like building it is housed in is already a good reason to visit it, yet there are many more. We explored all different corners of the museum during our visit. Scroll down to the end of the post for some useful tips for your visit. 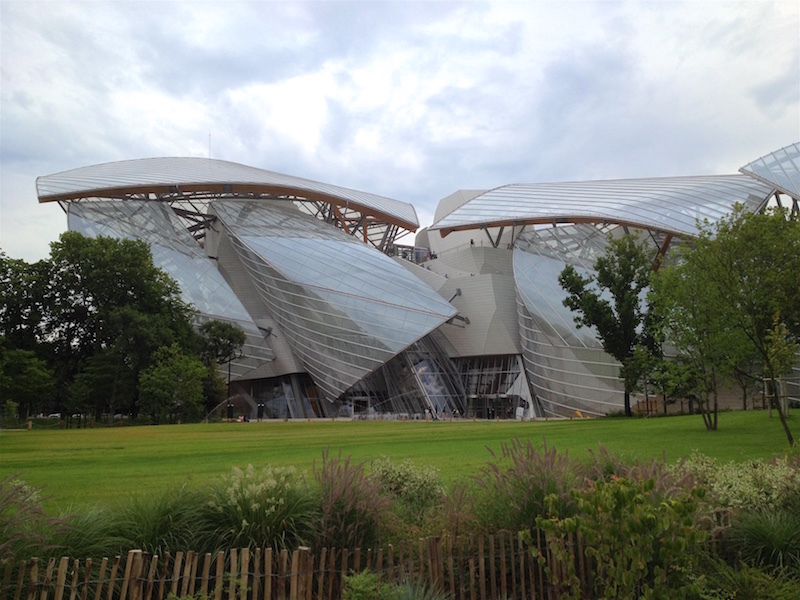 Walking up the escalator in the recently opened Fondation Louis Vuitton in Paris, the happy tune of ‘Viva Espana’ was reaching my ears. Coming up to the first floor of the museum I halted in front of a large tv-screen, where a video was playing starring a young, attractive woman being chased down the street by many men, young and old. You could see the distress in the woman’s face, the panic.The accompanying music of ‘Viva Espana’ made the scene somewhat confusing, yet having caught my attention I sat down to watch it. My heart stopped. My mind got even more confused. The tears in my eyes came up, yet I couldn’t cry. There I was standing in one of the buildings I had been waiting to see as from the moment it opened, soon a year ago. The first attempt to do so, was during our visit to the city towards the end of the winter last year, but as the museum just opened and the cultural-minded Parisians were as eager to see this quirky, modern building as we were, we considered the lines just too long to spend our precious time waiting. So at the time we decided to save the museum for our next visit, which – thanks to one of my dear family members – was sooner than we thought! Being lucky enough to live at a driving distance to the city of love (Amsterdam is just some 5 hours driving from Paris) instead of taking the train, bus or plane, together with my sister and her partner we drove to the city by car, which we conveniently parked at a long-term parking in one of the city’s suburbs. 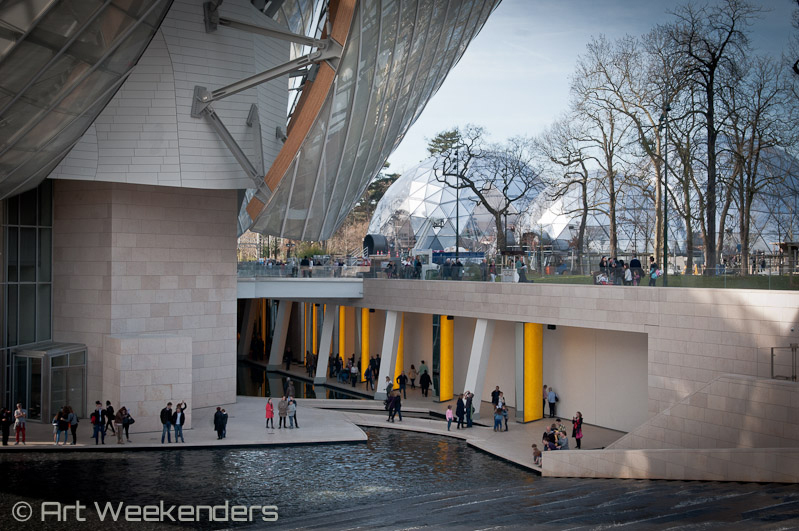 Having found our hotel, we started planning a bit more and considered Friday night would be a perfect night to visit the Louis Vuitton Foundation, as the museum would be open until 11pm and would give us splendid views over the city by night. 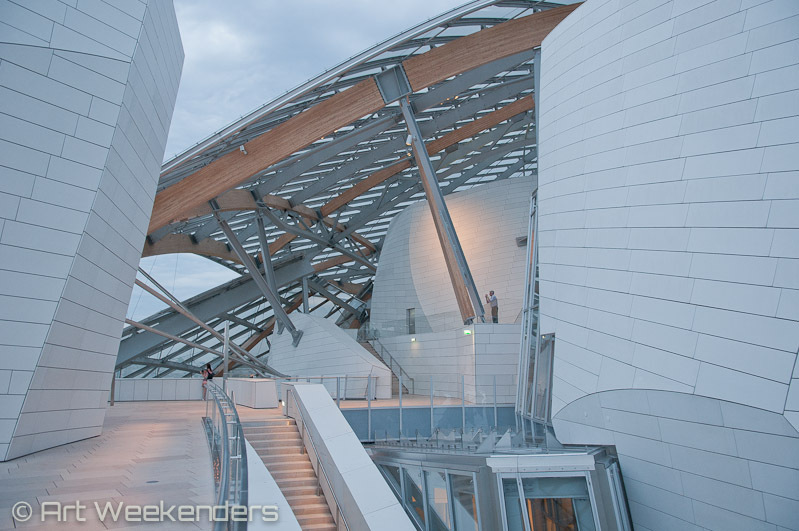 And so it happened that at the moment I heard that my last grandparent passed away, I stood here in the heart of La Fondation Louis Vuitton, which will unwillingly remain a place I will remember forever. Yet, I should confess that also without this news I would have probably been quite enthusiastic about this museum, longing to go back more often. 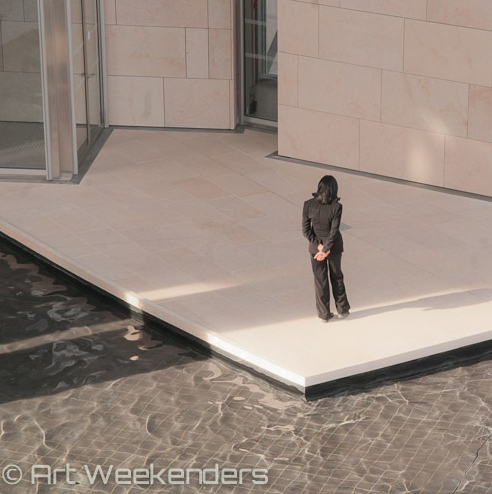 Although we considered to leave the museum for a tiny moment, at the end I decided I wanted to stay and go through my emotions while wandering and discovering the uniquely designed building with all its corners, spaces, turns and views and not to forget its stunning contemporary art collection. And so we did. I often sat down, gazing ahead of me, spacing out a bit, feeling the magic atmosphere of this bright and spacious building, while dealing with the shock and sadness that at other moments overwhelmed me. 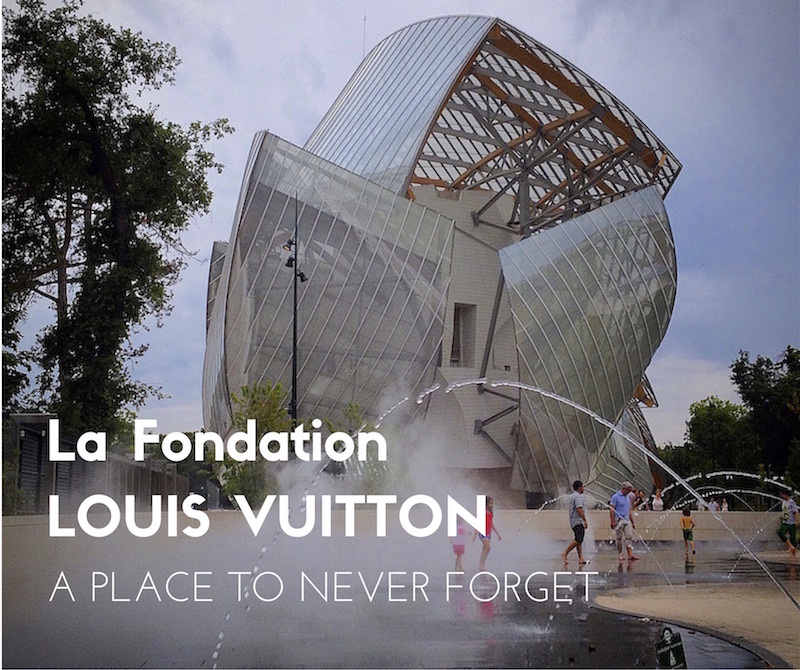 Now, for those who haven’t heard about La Fondation Louis Vuitton before, don’t let the museum’s name confuse you about its content and purpose. 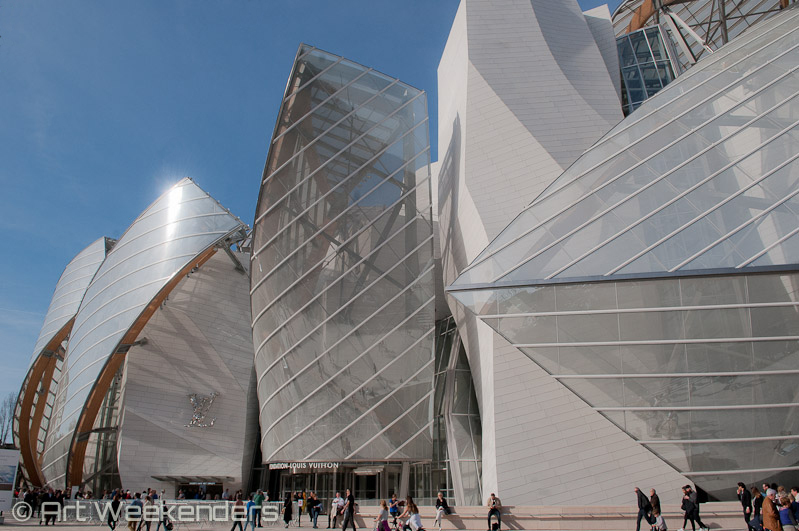 Although the design of the building was indeed commissioned by the Louis Vuitton company, it was not with the purpose to share everything there is to know about the Louis Vuitton empire, its history or heritage. 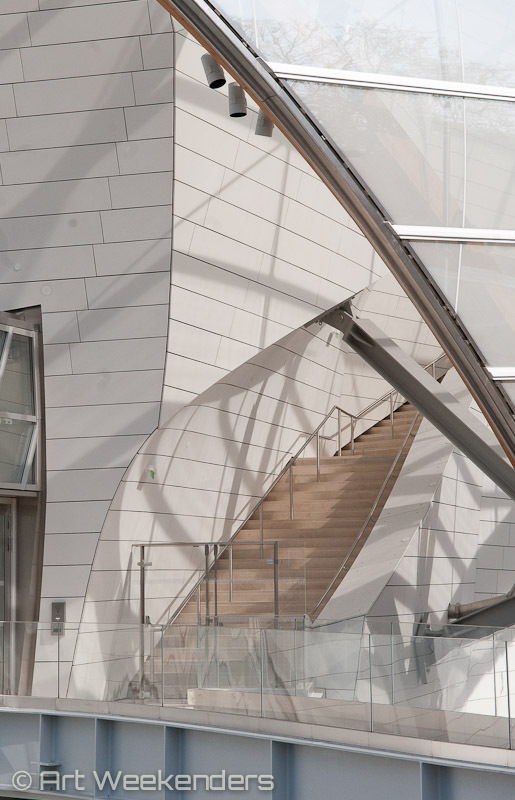 The goal of the Louis Vuitton Foundation was among others to house the company’s rich contemporary art collection, while at the same time creating a space where this vast and interesting contemporary art collection would be accessible to a wide and international audience. 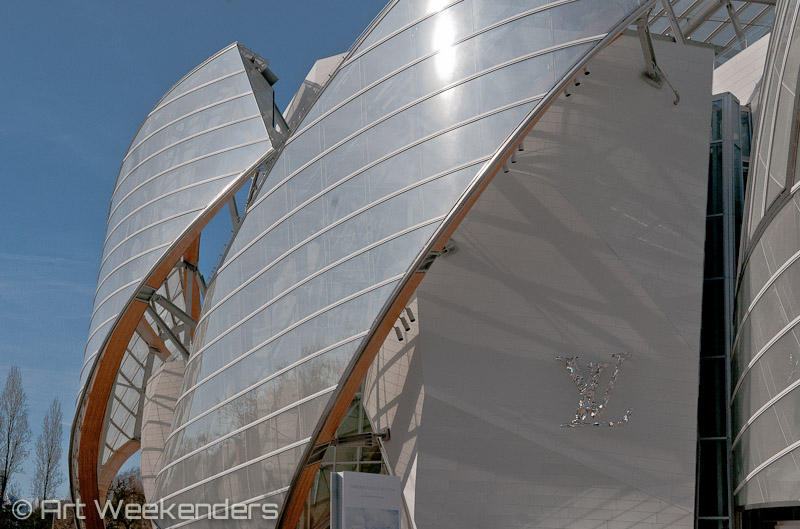 With a prestigious company like Louis Vuitton it’s not surprising that one of world’s renowned architects Frank Gehry was chosen to design the contemporary art museum, which is situated in the Bois du Boulogne, Paris’ city park. As from the start the new museum was a topic of discussion for many, as not everyone was as happy with one of the most quiet spots in the city being disturbed by this colossal museum and all the people it would attract, let alone with the design of the facilities. Yet for me, the ship-shaped building – with all its different corners and rooms of which non felt the same – was just a pleasure to explore and wander around all night. 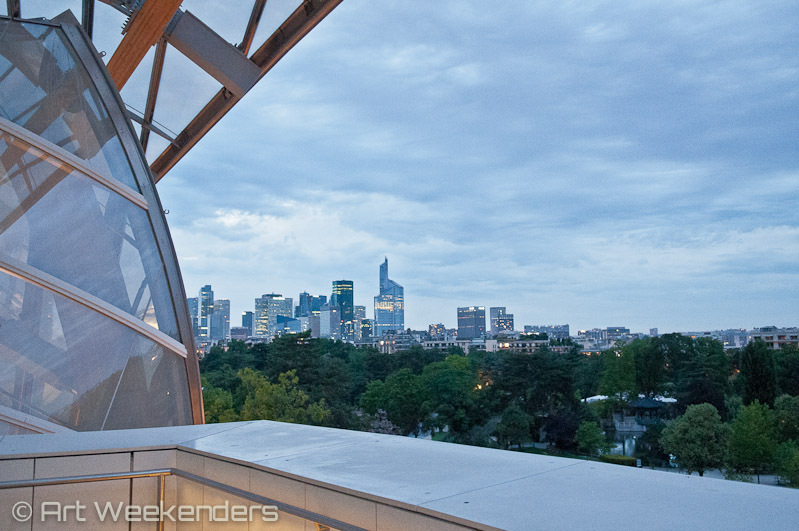 Sure, the design is extraordinary and remarkable for Parisian standards, but it certainly doesn’t look awkward at all at this location in the middle of all greenery with a view over Paris’ modern neighbourhood of La Defense on one side and a view at the Eiffel tower from another side. 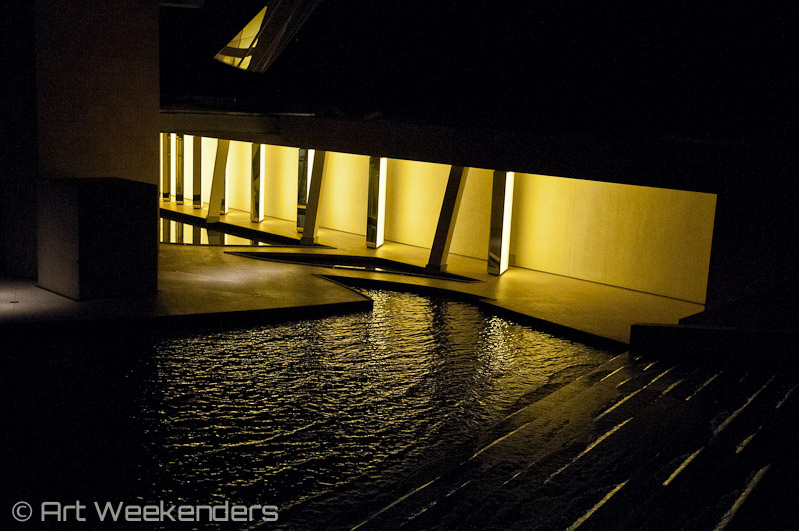 Of course, the art objects and installations at display – of which some are specifically made for this building, like the one of Olafur Eliasson in the bassin – do add to this feel of being in a very special place. The museum houses many impressive art works of high quality of different established names, like Munch, Basquiet and Warhol, but also of those lesser known to the general audience. As the art works regularly rotate to show another part of the collection and the museum has so many different corners to explore, no visit will be the same. Next time for us hopefully a much happier one. – Buy your tickets online at the museum website. In that way you minimize the risk that you will have to queue. – Instead of using the main entrance you can also enter via the Jardin d’Acclimatation next door and enter the building from the backside. From this side you can also take an excellent picture of the whole building without any trees in your way as is the case at the front of the building. – The museum is regularly open til late and offers stunning – late night – views over the city including the Eiffel tower, provided the sky is clear of course. 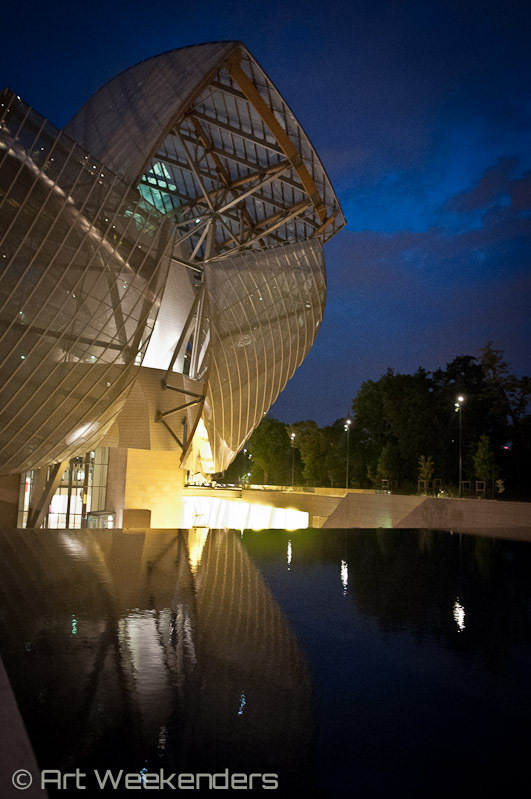 So why not spend your evening at La Fondation Louis Vuitton? – Take at least 3 hours to see the whole building and its art exhibitions and make sure to reserve some time to see what’s in the ‘bassin’. – The museum offers different free Apps in the iTunes store, among which the ‘Promenade Architecturale’ and the ‘Archi Moi’ App, the latter specifically made for children to learn more about the museum. 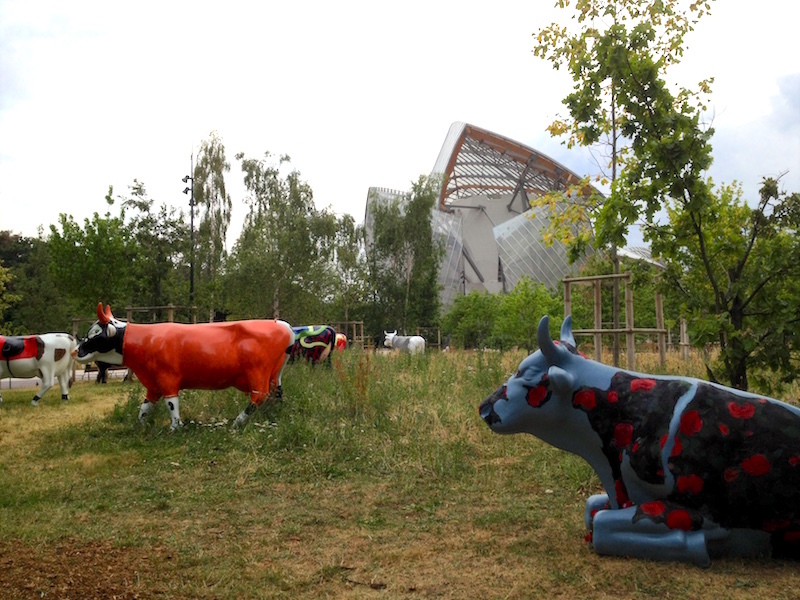 – The museum is some 10-15 minutes walk from the metro station Les Sablons. There’s also a Foundation shuttle (1 Euro) leaving every minute from Place Charles de Gaulle, on the corner of Avenue de Friedland.